Aside from “just outside of Boston” and “I want to study environmental studies, too!”, the phrase most often inundating the ears of us untested first years is: “Bowdoin has a commitment to the common good.” In truth, the common good is everywhere: applicants can choose to write a supplement essay about what the common good means to them, recently accepted students receive a poster emblazoned with “cooperate with others towards common ends” and while signing up for pre­-orientation trips, first years might notice that many of the trips are organized by the Joseph McKeen Center for—­­you guessed it­­—the Common Good. And this is all before even arriving on campus. 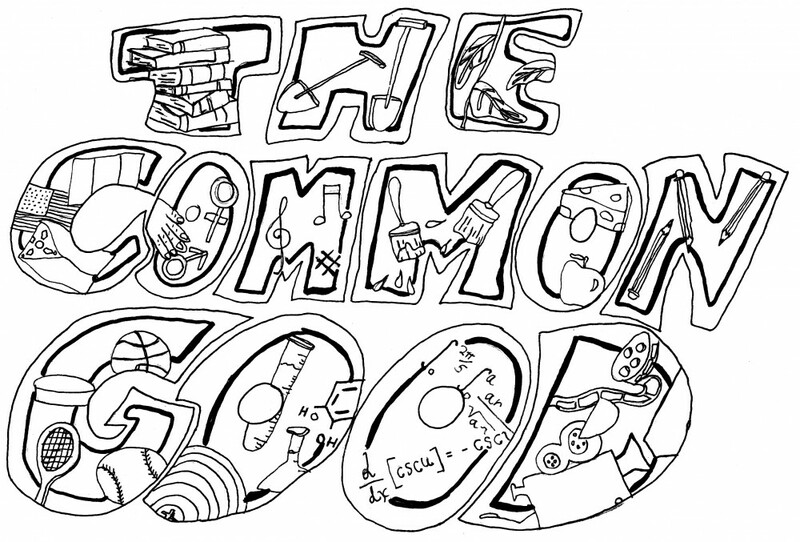 Once on campus, the deluge of common good-ness only continues, making an appearance in nearly every welcome address, in classes and during floor meetings. Only three weeks into the semester, students, faculty and staff alike descend on Farley Field House, wielding shovels and paint brushes to participate in Common Good Day, a day of service and community­-minded fun. Despite the super-abundance of appeals to this lofty ideal, my fellow first years and I have entered our time at Bowdoin with just as tenuous a grasp on this mystical concept as when we first received our letters of admission. The average first year probably knows that a commitment to the common good entails some involvement with volunteer organizations; the particularly inquisitive one might have discovered that the phrase is drawn from Joseph McKeen’s speech at the Opening of the College in 1802. Given that the common good is just that—­­common­­—perhaps we should be asking not what the common good means to each individual, but rather what it means to us, the Bowdoin community as a whole. If we hope to rescue this powerful ideal from the grasps of inarticulacy, we ought to attempt first to unearth its origin, beyond its emergence in President McKeen’s address. As the philosopher Charles Taylor argues in his 1989 book, “Sources of the Self,” the language of common goods first surfaced among a circle of 18th century thinkers known as the Deists. Often seen as the middlemen between theology and modern science, Deists eschewed the notion that God acted continuously on the workings of the world, arguing instead that God, having created the world to operate by certain principles, let it be. We can discover those principles, the Deists argued, through the methodology of the natural sciences. Reverence for God, then, comes not from his constant involvement in the world, but from his benevolence: the knowledge that he created a world, as Taylor puts it, “in which the purposes of the different beings inhabiting it...so perfectly interlock. The world was designed so that each in seeking his or her own good will also serve the good of others.” This goal of harmonious ends is the common good, or as Deist philosopher Matthew Tindal wrote, the “common Interests, and Mutual Happiness of [God’s] rational creatures.” James Bowdoin, himself a prominent man of science, would certainly have been familiar with these ideas. “The writings of Arminians and Deists...filled Bowdoin’s library shelves,” wrote Bowdoin’s biographer Frank Manuel. Although many, if not all, in the present­-day Bowdoin community have left behind the Deists’ providential theology, there is nonetheless something important to be learned about our sense of common good from this genealogy. What is praiseworthy, even divine, for the Deists is that personal goods, when structured correctly, can serve the goods of the many—­­that we must not deny our own good in order to serve the goods of others. Absent the hand of providence, this aim is still possible through the proper institutional structures. Within these structures, it is through one’s own particular excellence, not by stepping outside of it, that an individual can contribute to the common good. The math major need not take up a shovel, nor the environmental studies major a frying pan, in order to serve the common good. Within a community of exceptionally talented and exceptionally bright individuals, this, I believe, is a sense of the common good, which could, once again become, well, common. Ian Ward is a member of the Class of 2020.